After shredding your zucchini, lay out on a clean kitchen towel and sprinkle salt on it. In a medium mixing bowl, add in zucchini, onion, bread crumbs, eggs, and cheese. Add salt and pepper and stir well. 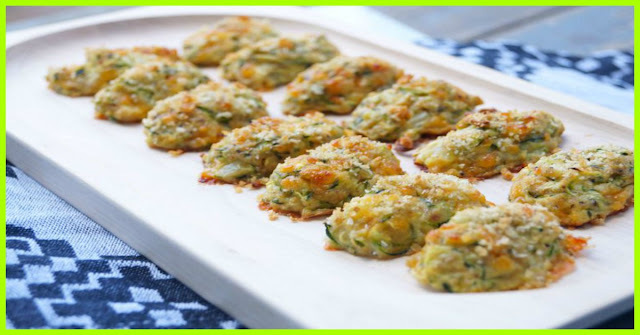 Spray a 24 cup mini muffin with cooking spray and then put zucchini mixture in each cup. Press each cup down slightly to compress. Sprinkle each cup with just a few panko crumbs for some added crunch. Alternative Method: Shape heaping tablespoons of zucchini mixture into small football shapes. Place on a non-stick cooking sheet. Bake at 400 degrees for 16-20 minutes, or until slightly golden brown and desired crispiness. We like ours crispy so I usually do 20 minutes. If using the muffin pan, run a knife to loosen as soon as you get them out of the oven. Let cool for a minute and then remove from pan.Enjoy!